Agate Falls is located on the middle branch of the Ontonagon River and is one of the most beautiful cascading falls in all of Upper Michigan. The falls are created as the river drops over an extended shelf of sandstone ledges. The resulting waterfall is a broad band of interlacing cascades and small falls nearly 40 feet high. This falls is a great spot to visit on your way to or from Bond Falls. You can follow a foot trail to see this majestic sight. There is also an old bridge that passes above Agate Falls, which once carried the tracks of the Duluth, South Shore and Atlantic Railway. In the winter it is now used as a snowmobile trail. Parking, water, toilets and picnic tables are available at the park. 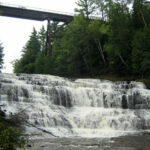 Agate Falls is generally open from early May through late October. 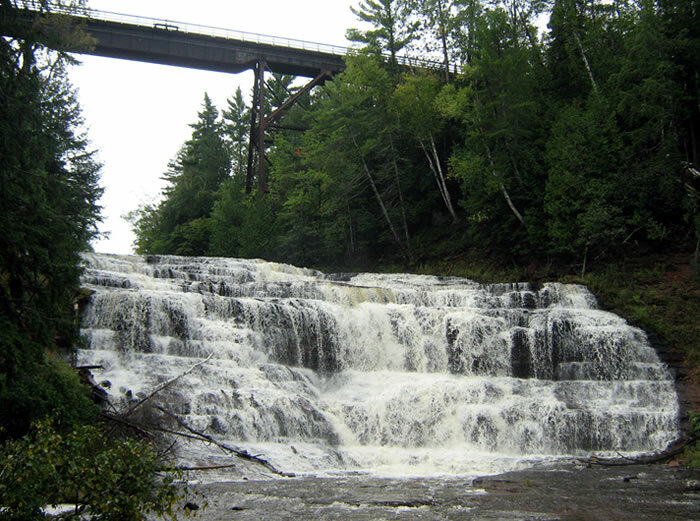 The waterfall is 7 miles southeast of Bruce Crossing, Michigan on the state highway M-28. Agate Falls is a Michigan Scenic Site and requires any vehicle to have a Michigan Recreation Passport.